Meet Skat Jacket, aka Skeeter. I figure other people dedicate their sites to their favorite dog or cat, why can't I dedicate mine to my buddy Skeeter. And now, 27 years minus 1 day, Anna joins him. Gone but not forgotten. Goodbye Anna puppy dog. As with Skeeter, you will always be missed. I've always had a love of horses. I'm sure this is in part due to the fact that my folks had horses before I was born and I was in the saddle as a baby. No lie, I have pictures. :-) I was three or four when I had my first pony. The only way I could get her to "go" was if I led her to a wooden fence away from the barn, climbed on, and away we went -- right back to the barn. :grin: Sadly, when I started Kindergarten, Judy and the rest of the horses had to go. Dusty (the colt) went I don't know where, Pepper went back to my Grandpa's place 250 miles away, and Snooper was sold to someone in the area, which years later turned out to be my 4th grade teacher! This horseless state didn't last too many years though. I think I was 8 maybe 9, when a friend of ours who worked Saturdays at our local sale barn (for you city types, that's where farm livestock is sold once a week, cows and pigs mainly), turned up a little sorrel pony. I don't know if my folks had asked him to keep a look out for one or if he did it himself. All I know is that Dad told me Ron was bringing a pony out just before the pickup and trailer arrived. I can't remember my exact reaction but I know I was happy! Poncho was a pretty guy, 48" tall, golden sorrel with "white" mane and tail. He was trained to pull a cart, but he could be ridden. He just didn't know how to neck rein (steer with one hand). So that was my first foray into horse training! Teaching Poncho how to neck rein. A year later I was old enough for 4-H, and of course, besides the "required" girl's projects I signed up for the Horse and Pony project. Ron once again came to our aid. He had two kids several years older than me but still in 4-H and Kim taught me lots of things as well as our 4-H project leader. That first 4-H horse show at our county fair had me hooked! As luck would have it, the very next weekend there was an open horse show. Mom and Dad brought me and Poncho. Well, we didn't do so well. Poncho and I got a consolation ribbon. After all the blue ribbons we'd won the week before at the 4-H show, I was devastated. I cried. Poncho just wasn't meant to be a Pleasure pony. That might have been the end of it, except for the fact that I still wanted to show horses. And Daddy came through again! He had another friend who owned one of the local shoe/leather repair shops in town. Miles owned a show pony that hadn't been ridden in a few years since his son had outgrown him. I got to do a test ride (to see if I could handle him), and so for the next few years Red joined Poncho at our place. 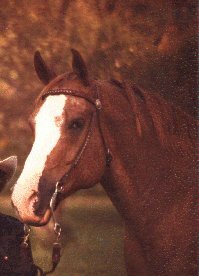 Red (Red Man's Brave) was a 50" Pony of America (POA), basically an Appaloosa in a pony package. And thus began my show career. Red and I won several ribbons and trophies including a few horsemanship classes. Poncho wasn't forgotten. I turned him into my gaming pony. He and I did barrel racing. I eventually outgrew Poncho and had to sell him. That was a sad day. But I had already fallen in love with my new speed pony, Firefly. She truly looked like a miniature Quarter Horse, she was that put together. She was a red sorrel with a blaze face and two white hind socks. Her only detractor was her slightly blocky head. But she and I won many a halter class. She was too firey to become a pleasure pony though, so we ran barrels and sometimes the pole bending classes. But what we exceled at were the Trail classes. Nothing fazed her. I could do practically anything with her *but* pleasure, and if I'd known how I probably could have settled her for a pleasure pony. Then it was time to return Red. I'd gotten too old to ride him in the Pony Pleasure class and he wasn't tall enough to graduate to the Youth Pleasure class. So, enter Red Stone's Fantasia (aka Fanny). She was a 55" Appaloosa mare. Beautiful blue roan color, but Appaloosa rat tail. Poor thing. We didn't know until much later, but we figure she had been abused in her former home. We got her home and almost immediately had to have the vet out to look at her. She had distemper. That's like a bad case of pneumonia in humans. We nursed her through it and when she was well enough for me to try riding, that's when we discovered how head shy and skittish she was. Couldn't even clip her for shows without taking her down the first few times. Very gradually I got her over the majority of her fright and got her to the point where she could be tied to a trailer without the neck rope. It's one of those, if I knew then what I know now she and I would have developed an even better relationship. Oh well. I eventually sold her, mainly because she was too short, but also because she required an awful lot of riding to keep settled for a show (she also had a very rough trot). During all this we'd also purchased a couple of yearling Quarter Horse geldings, almost a matched pair with the intent to train. They did get trained and I did eventually show both of them. The smarter and prettier of the two got trained first. He would have been a good halter horse, but his hoof conformation wasn't the best. He was almost too smart. He got bored easily. He eventually became my speed horse and Lee, his half brother eventually became my pleasure horse. Sold Lee and bought Buddy an 11-year-old QH. Was going to make him a pleasure horse or a speed horse. Neither worked out quite the way I'd hoped. I eventually sold him in favor of keeping Ace (Lee's brother). Sorta wish I'd sold Ace instead, but oh well. Somewhere in here I had to sell Firefly because I'd outgrown her, too. It was only afternoon she was gone that Dad told me that if the boy who bought her hadn't, he was going to let me keep her and put her out to pasture with our cows. Bummer. Of all the horses I had to let go of, I cried the most for her. For a brief time I showed a friend's QH she'd trained herself. Even won the QH pleasure class with him at the county fair's Society Horse Show that year. Rebel was a good looking horse. Blood bay with black mane and tail no chrome (no white markings). We were considering buying him. But then Skeeter came into my life. Another friend, (he'd spent many of his teen years working on a horse farm in NY state) brought Skeeter back from New York and he boarded at our place for a couple of weeks while Bob was getting his place ready. I fell in love. Skeeter was an Appaloosa with a coat color similar to Poncho (remember him?). Skeeter was well-trained, willing, and fun. He was also a goof. He was a lot like Firefly in that not much fazed him and I could do virtually anything with him, from halter, to pleasure, trail, to even speed events. Time passed, I reached 18, my last year in 4-H and was headed off to college in the fall, three hours away. Facts were that I probably needed to sell Skeeter. :-( Didn't want to, but it it was the practical thing to do. Had one guy come out and look. He really, really liked Skeeter, but Skeeter required an experienced rider and unfortunately the young man wasn't. Skeeter didn't get sold that summer, much to my happiness. :-) I was only willing to part with him at a certain price, and up to that point no one had been willing. So I got to keep Skeeter for a while longer. Mom and Dad took care of him during the fall and winter and spring while I was away at school. I got home from my Freshman year May 12th. The week before there had been a storm that had spooked Skeeter and he'd somehow managed to scratch his eyes on some tree branches. Once a day his eyes had to be treated with ointment, and Mom had been doing this. I took over the chore the day after I got home. I cleaned his eyes and let him back out in his pasture, which happened to wrap around the back of the house. We'd always get a kick out of how Skeeter would seem to know if an apple fell from one of the trees and canter from the barn to the orchard to find it. That evening, not quite an hour after I'd put him away, Mom and I were watching tv in the living room. We could see Skeeter in the orchard from the living room windows. To this day I'm not sure what happened. One minute I'm watching tv, the next, Skeeter slams into the side of the house, making the windows rattle. We race outside, I guess Mom goes to get Dad, who's in the shop, and I'm looking for Skeeter. I figure he's run off somewhere. No. As Mom and Dad approach from one side I run around the other, looking for my horse. Skeeter hadn't run anywhere--except maybe into the side of the house. You see, the electric fence there was only about 10 feet from the house and there's a small embankment to help water runoff. We don't know if he had a massive heart-attack, or just what, but we think he was gone before he even hit the house. I was completely devastated. I think I cried for hours. I never again looked at Friday the 13th in May as just another day. For 27 years I've been without a horse. Always dreaming, hoping, maybe a little scheming, that someday I'd have another or at least be able to ride. A few years ago I happened upon a woman who gives riding lessons and clinics once a month very near to where I live. As opportunity and time permitted I and my daughter have taken lessons from her. Three months ago I re-connected with her and have been taking lessons on a regular basis on the same horse. I finally admitted to myself that I didn't have to own a horse, I could lease. So very recently I signed a lease on the horse I've been riding once a month since November, so I'm back in the saddle again!